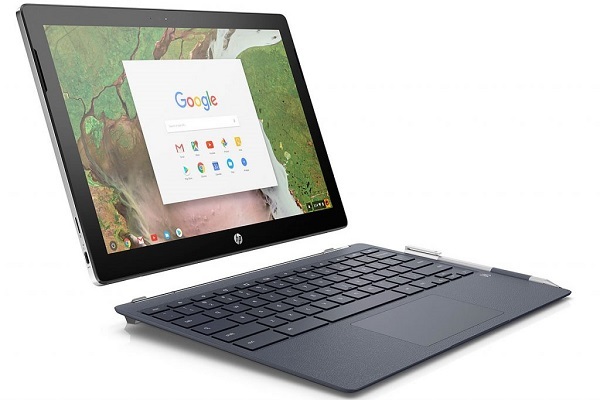 The HP Chromebook x2 comes with a Quad HD 12.3-inch diagonal Corning Gorilla Glass 4 touch display and features ceramic white anodized aluminum finish and a leather-like surface in Oxford Blue on the detachable full-sized keyboard. This thin, powerful Chromebook detachable features 7th Gen Intel Core processors and up to 8GB LPDDR3 of memory to browse and run Android apps. The HP Chromebook x2 comes with the versatility to use the device in a variety of modes. The magnetic hinge allows for easy detaching of the tablet and provides the strength and rigidity to keep it attached and upright when used as a laptop. The hinge design allows for the tablet to be placed in multiple modes for users to enjoy an amazing touch and pen experience for work, school, and entertainment. It offers up to 10 hours of battery life in a tablet only 8.2 mm thin and weighing 1.62 pounds. With the included keyboard the device is 15.3 mm thin and weighs 3.14 pounds. Experience apps from Google Play store as a tablet or notebook with a touch screen and active pen. The Chromebook x2 offers plenty of space to store treasured content with up to 32 GB of built in storage with Micro SD expansion up to 256 GB along with 100 GB of free Google Cloud storage for two years. Dual speakers with audio custom tuned by B&O Play and front 5 MP, rear 13 MP cameras to deliver a rich entertainment experience. The HP Chromebook x2 offers a broad array of ports to meet connectivity needs including two USB TypeC for data transfer, charging and display, a Micro SD port, and Audio jacks.